Allow approximately 30 minutes for caching water. Trail Notes: All trails are blazed yellow. Forest roads are not signed. From the parking area walk back up the road until you reach the hikers stake for Buck Mountain Trail (434). This section of the trail goes through a damp spot so expect it to be weedy in the summer. The trail crosses Little River and then seems to disappear at a washout and tangle of fallen trees. It continues on the other side. It’s best if you work your way to the right of the tangle and then back into the woods. You should soon regain the trail and a yellow blaze. The trail zig-zags across the flood plain with the base of Hearthstone Ridge to the right (north) and the river to the left (south). Watch out for stinging nettles. At one point the trail nearly joins the river. At 2.6 miles from the parking lot cross the river again. (It might be dry in the summer.) Here you will find a suitable spot for a tent or two. Begin a steep climb, first along the north flank of Buck Mountain and then straight up its back. This is the hardest part of the hike. 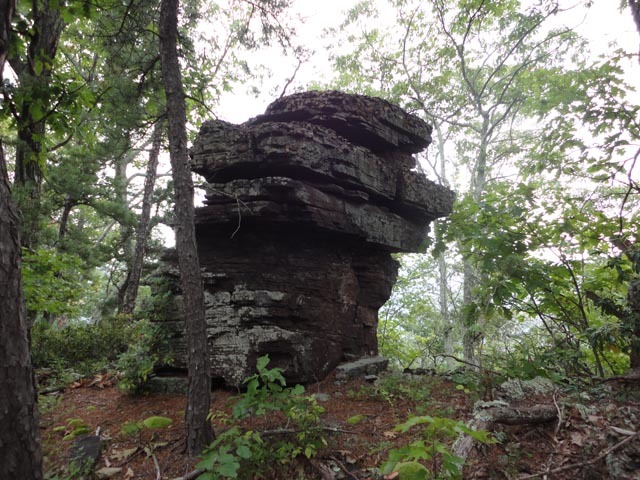 In 3.7 miles the trail becomes an old haul rode as it crosses a clearing and merges with dirt Bald Knob Road. Here is a large flat grassy area suitable for camping. In the back you’ll find an overgrown trail. If you can navigate it you will find a seasonal spring and the headwater of a feeder that flows into North River. If you decide to push on there are several other wildlife clearings to camp at. In 2.2 miles reach the intersection with dirt FR 85. Turn right and switchback up the backside of the ridge that Reddish Knob sits on. In 1.3 miles pass a vista and primitive car camping site on the left and in another 0.2 miles arrive at the paved portion of FR 85. Turn right and climb about 0.3 miles to the parking area (Please block out the graffiti on the asphalt.) and enjoy the views. To the west is Sugar Grove Naval Base (I still don’t know how they get the ships there. Actually it’s a Comm facility. 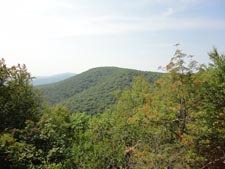 ), Shennandoah Mountain and other mountains of WV, to the north and east are Massanutten Mountain and the Blue Ridge, and to the south are Little and Big Bald Knob, Trimble Mountain and other assorted peaks of the GWNF. After taking in the views retreat to Timber Ridge Trail (431) and collect your water cache if that was in your plans. The rest of the trek is generally downhill with a few sneaky hills that might make you stop to catch your breath. Traverse a narrow talus slope which offers a splendid view of Little Bald Knob. In 2.9 miles pass Wolf Ridge Trail (378) on the left and in another 0.8 miles arrive at the junction with Sand Spring Mountain Trail (423). Straight ahead is a clearing with a fire ring. A little further down this trail is a wildlife pond. This is the only good spot to camp on the ridge if you planned your trip over two nights. Bear right to stay on the Timber Ridge Trail and descend along the crest of Hearthstone Ridge. Pass two more wildlife ponds; one on the left in 1.5 miles and the other on the right in another 0.4 miles. 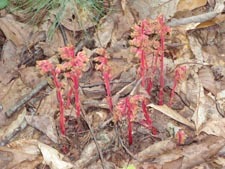 You’ll also be passing through a large swath of oak forest which has been defoliated by Gypsy Moths. The open canopy seems eerily odd. You know you are approaching the end of the trail when you pass through a dense Hemlock grove with its soft needle tread. Arrive at gravel Tilghman (Tillman) Road that you drove in on in 2.0 miles from the last pond. Turn right and hike 1.3 miles back to your vehicle. It’s a shame but swimming is not allowed in the lake and about now you are probably ready for a refreshing dip. 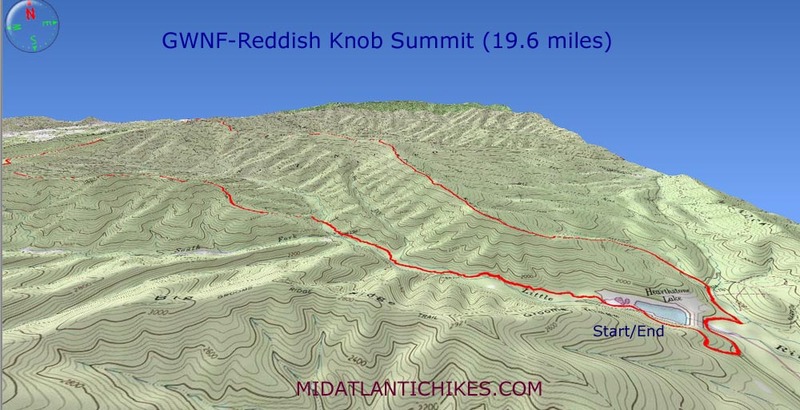 Outing Critique: The Reddish Knob Summit is a really remote hike that all the animal life. We saw eagles, signs of bear, 7' rattlesnake, and much more. The bear markings where intense around the mile 5-8 and also one the way down. There was a den of bears somewhere at mile 6-7 in the rocks. The trees were marked by claw marks at 6' up. Trees were pushed over, and the brush was thick you were walking through. If you were doing this alone without making noise this is not a good idea. The camp sites were remote and the only one that looked like you could somewhat pitch tent was the car camp site off the dirt road near the top. 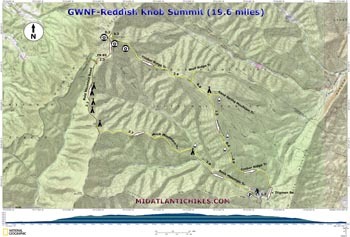 (See trail notes) The trail is marked yellow until you hit jeep road, dirt roads, and follow the trail notes with map. About two miles going down the mountain the trail is nearly impossible to go through. We were wearing gaters to our knees and hiking boots. Our arms and knees had some major scratches. The trail is so thick you think you lost it, and then you see yellow. You will go 15 minutes to 30 minutes until you see another yellow marking. The trail notes refer to open field for camping the grass is about 2-3 feet tall. Rattlesnakes we saw were in it. We saw a 7' rattlesnake, that would not leave us alone when we stopped for lunch. We moved one. He was too friendly. You will need to drop water at the top. The best idea ever from the trail notes and website. Oh have fun driving up the mountain road to the top. You will learn to pray very quickly. Amazing views, and they are so worth it when you hike to the top. We hiked the whole loop in one day 12 hours with 40 lbs in the backpack. We were planning on camping on the mountain. We did not find any camp sites that we want to camp at, and the bear activity made us rethink it. I enjoyed the hike, my wife did not like the bear activity and rattlesnake. Critique: This was a great hike with some of the best views I have ever had on a summit. We did it as a 3 day backpack, but it can easily be done as a two day trip. A few words of caution though. 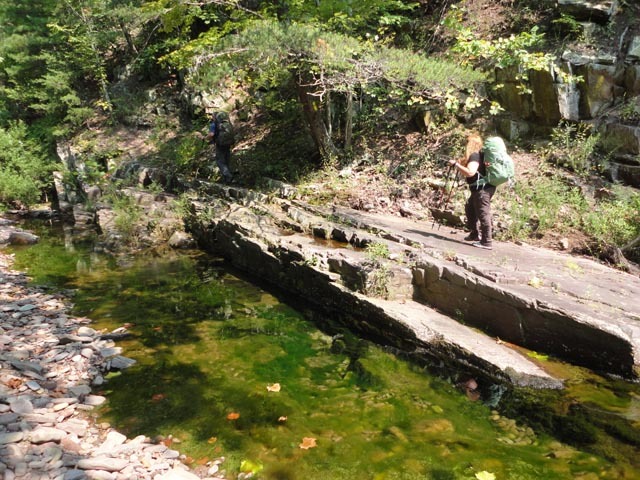 The lower section of Buck Mtn Trail contained 3 shallow fordings of the river, so plan accordingly. 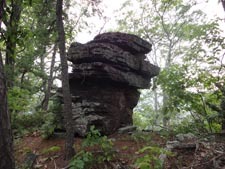 The upper section of Buck Mtn Trail was some of the most difficult uphill hiking around, definitely worthy of the strenuous hike rating, it was tough. After that the trail is great, with spectacular views at Reddish Knob. Water was a challenge to find at the first spring on Bald Mtn Rd, it is more than 500ft off the trail, a GPS is probably the only way to find it. 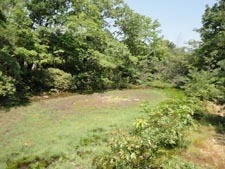 The trail leading to the spring was completely overgrown, hard to find, and not a reliable path to find water. I don't think it even leads to the spring itself, you will have to bushwhack. The coordinates are N38 25.418, W79 15.175 from our GPS. 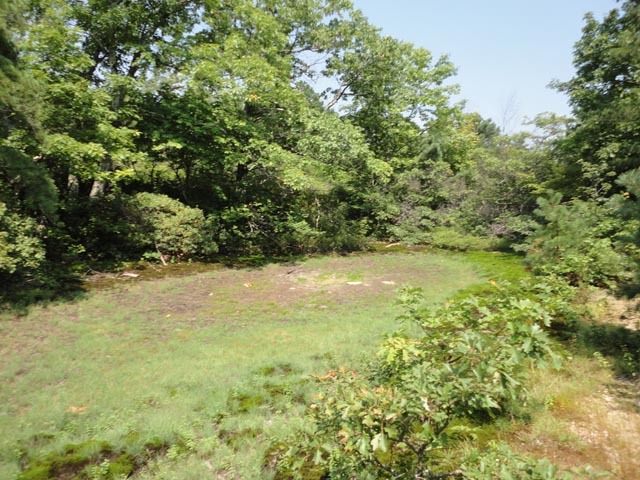 The ponds on Timber Ridge Trail were reliable sources of water this time of year. 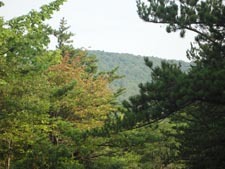 There were few leaves on the trees this time of year which lead to great views of the surrounding ridges and valleys for almost the entire hike. Great views if you're willing to tough out the hike up Buck Mtn. Critique: Overall, a great hike with most of the details laid out. For winter hiking, the weather was changing constantly. We started out with 60 degrees and warm, followed by rain and wind for the latter part of the day. Waking up the next morning with 3 inches of snow. There were about 3-4 river crossings prior to reaching the hike up to the summit. I wish I would have known about those. The climb up the first mountain was strenuous, but fun. The distances were pretty accurate for the hike descriptions. Descending the next day was enjoyable but our legs are paying for it for the 3700' descent in one day. 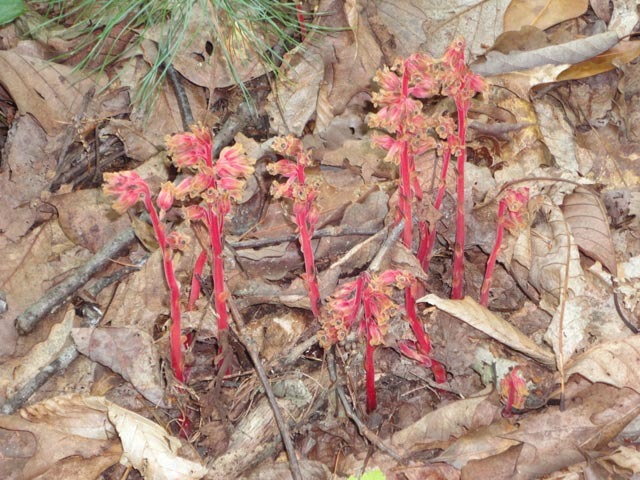 Thanks for posting this and we look forward to trying many more of the hikes this year.